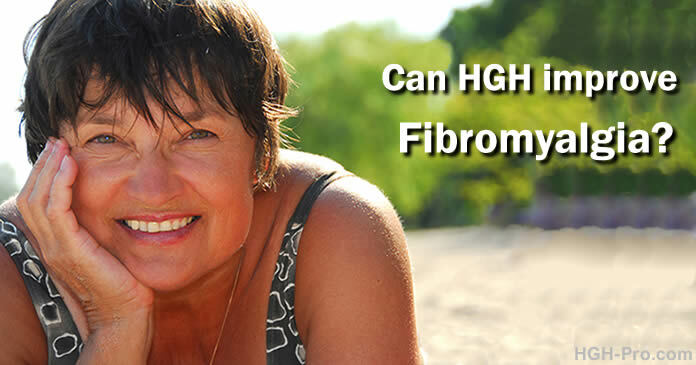 HGH and Fibromyalgia | Can Human Growth Hormone Help? In the 20 years I have been involved with human growth hormone therapies I have many times been asked whether it helps those who suffer with fibromyalgia. Over these past years we have had clients diagnosed with fibromyalgia who have reported improvements with their symptoms while taking our product, and I consider my own fibromyalgia gone due to taking homeopathic HGH. In fact, I began working with these products because of the many benefits I received. Clinical studies have found a correlation between patients with fibromyalgia and low blood IGF-1 levels. The growth factor IGF-1 (insulin-like growth factor #1) is released by the liver in response to the release of growth hormone by the pituitary gland. Because of this fact patients with low IGF-1 levels usually have low HGH. Some improvements were seen in the first 6 months with significant improvements being seen after 9 consecutive months of HGH therapy. Studies of test subjects found that symptoms decreased substantially with the increase of their previously low IGF-1 levels. After the study, when the growth hormone therapy was discontinued, the test subjects reported a worsening of their symptoms. Improvements in symptoms have been reported by patients taking synthetic HGH injections and also by patients taking non-injection products such as high quality homeopathic products that help the pituitary gland to produce and release more of its own human growth hormone. As stated, through the years I have heard many positive reports from my clients taking homeopathic HGH therapy. If you would like to learn more about human growth hormone please click the links on the left. Fibromyalgia is defined as "pain in the fibrous tissue of the body". It has been around for a long time, yet in the past it was often misdiagnosed as rheumatoid arthritis, hypothyroidism, chronic fatigue syndrome, or giant cell arteritis. It is not life threatening, it is a chronic disease. We do not know the exact cause and it cannot be diagnosed by the usual medical tests such as blood studies, X-rays, MRI's, CT scans, etc. Between 3 to 6 million Americans presently suffer with fibromyalgia. It is much more common in women than in men by a ratio of 20:1. The onset typically occurs between the ages of 29 and 37, although it can strike at any age. As a registered nurse and also a past sufferer of fibromyalgia I have witnessed an opinion by some in the medical profession that the idea and symptoms of fibromyalgia are in the patient's head. In the medical community some have had the opinion that some physicians will diagnose a patient as having fibromyalgia when the physician cannot find medical evidence of any other illness. Some believe the doctors do this partly to satisfy the patient by giving him/her a specific diagnosis. Fibromyalgia is now finally getting more attention in the medical profession as a legitimate diagnosis but there are still some who have the opinion that since it is not life threatening and cannot be diagnosed by traditional means, and because it is chronic the patient must learn to live with it. Thankfully, we are now moving away from that way of thinking and are now giving patients with fibromyalgia the attention and concern they deserve. Human Growth Hormone: Is needed for homeostasis and rejuvenation, is primarily secreted during deep sleep. Studies show a tendency for fibromyalgia patients to have low IGF-1, which reflects the amount of HGH in the body. Nutritional Deficiencies: There is new evidence to support the thought that deficiencies of magnesium may play an important role and vitamin D, and folic acid are receiving attention. Some studies have also shown that deficiencies in serotonin precursors such as tryptophan may be a cause. Disruption in Restorative Deep Sleep: Serotonin is needed for deep sleep, when it is depleted the patient has less deep rejuvenating sleep. Altered Microcirculation in Muscle Tissue: This may contribute to muscle hypoxia and ischemia, causing the fatigue, muscle tenderness, and pain patients experience 24 to 48 hours after exercise. Increased Pain Perception Due to an Increase in Substance P: Substance P is a neuropeptide that carries pain signals. It helps nervous system cells communicate with each other about painful stimuli. An increased level of substance P leads to increased pain perception. A study found that fibromyalgia patients have less blood flow to two areas of the brain that regulate the amount of pain signals received by the brain, giving them less ability to control pain. Physical or Emotional Trauma: Some patients report symptoms beginning after physical or emotional trauma, such as a motor vehicle accident, divorce, or death of a loved one. Genetics: It may be familial in nature. Studies show that a high prevalence of patients have family members with the disease, particularly mothers (83%), sisters (63%), and daughters (26%). Interestingly, 19% of patients have husbands who also have fibromyalgia, indicating a possible environmental, dietary, or lifestyle component. Depression: This is a chicken or egg issue, does depression cause fibromyalgia or does fibromyalgia cause depression? As stated above, it is usually diagnosed by ruling out other conditions such as rheumatologic syndromes, hypothyroidism, etc., and by obtaining an accurate and detailed patient history. Pain in the upper and lower body bilaterally and on the spine and persisting for 3 or more months. Pain on palpation in at least 11 of the 18 tender points. Mainstream Western medical doctors may prescribe pharmaceutical drugs. Medications such as duloxetine (Cymbalta), milnacipran (Savella) and pregablin (Lyrica) are FDA approved for treatment of fibromyalgia. Anti-anxiety drugs and antidepressants such as tricyclics and selective serotonin re-uptake inhibitors (SSRI) are commonly used. Some prescribe zolpidem (Ambien) and alprazolam (Xanax) as short-term sleeping aids. Muscle relaxants and NSAIDs may be prescribed for muscle spasms and to control pain. Local anesthetics or corticosteroid injections at painful tender points are other options. Opiate analgesics may be used when pain is moderate to severe despite other therapies. Once the patient gets over the initial pain hurdle, one of the most beneficial treatments is exercise. Exercise increases endorphins, the body's natural painkillers and sleep-deepening substances and stimulates the secretion of human growth hormone, serotonin, and blood flow to the muscles. A physician who specializes in physical medicine and rehabilitation should recommend and design a program tailored to the patient's condition. For example, the patient may begin with just 3 to 5 minutes of exercise per day with slow increases to avoid inducing pain. Swimming or exercising in water is often recommended because it puts less strain on the joints. The patient's muscles may have atrophied from prolonged inactivity. Collaborating with a physiatrist should give the patient the support needed to build up stamina. Human Growth Hormone: Restoring the HGH level to what is optimum for the patient may improve symptoms substantially. 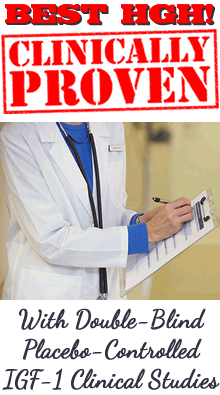 Doctors and patients monitor their growth hormone using the blood IGF-1 test. Nonpharmacologic treatments include cognitive therapy and psychotherapy which can help patients understand and deal with the pain and life changes brought about by fibromyalgia. Massage therapy can help with general muscle aches and pains and stretching can help limber up inactive joints. Acupuncture can be combined with other therapies for pain relief. Because symptoms change over time treatment is progressive and should be individually tailored to the patient. I developed fibromyalgia not long after my neck and back injury in 1997. Before I tried homeopathic HGH I lived with fibromyalgia nagging at me every day. It, along with my herniated discs controlled my life. There was hardly a minute when something wasn't hurting. Either my neck and shoulders, or my back, or my hands and arms, or my feet and legs were burning and hurting. I had rock hard knots in about every area of muscles, especially my shoulders and back, and those areas were very painful. Sometimes if I was having a massage and the therapist massaged too hard I would begin to feel like I would pass out. My skin was also so sensitive and painful that it felt to me like I had a sunburn, but I didn't. Thanks to homeopathic HGH I am much better. I don't usually even think about my fibromyalgia unless I am reminded of it. Every once in a while if I overwork myself physically I might notice some soreness and tension in my shoulders for a couple of days, but it is temporary and mild compared to how it used to be. In the past it was rare for me to have a good day due to the fibromyalgia, now it is rare when it bothers me. The HGH Plus IGF-1 product helped me more than anything else I had tried, including therapies my surgeon prescribed. Over these past 20 years we have had many clients report that they are seeing improvements with their fibromyalgia while taking our product so I believe everyone suffering with it should speak with their doctor about trying some type of HGH therapy.